How is this done? - Can someone elaborate on how this floor is done? Do the linoleum manufacturers custom cut shapes for the design? Great job Debra! That floor is fantastic! It's so refreshing to see a creative floor that one can live with for as long as the floor lasts. Nice result and a great design! New kitchen need floor - Where would I go to get this floor am currently doing a kitchen remodel and would love to do this. "The shapes are cut from the sheet linoleum and then assembled in the field.5 the seams are welded once the floor laid out." I'm becoming a huge fan of linoleum! What is the floor made of? Does something like this usually run on the more expensive side? I'm becoming a huge fan of linoleum - green and affordable. Designs that are labor intensive add to installation cost. Love this kitchen ! - How much does this kitchen cost. I'm on a budget of $40,000.00 Please include all from ceiling to floor.. Yes, this one is on the upper end of $70, but there's always more than one way to skin a cat! We can "massage " the selections to get you a similar look on a budget. Let me know if I can help. Debra Toney 303.393,1053. We can work long distance, though this process is a little easier if you have a builder in mind. What material is the floor made of? How can we find someone who can do this locally? I'm in Atlanta. WHY IS THE ANSWER ON WHAT IS THE COUNTERTOP SUCH A BIG SECRET? - WHAT IS THE COUNTERTOP? Its not meant to be a big secret, I just dont have access to that file any longer. Sorry, but it looks like a quartz product. I'm just not sure what brand! 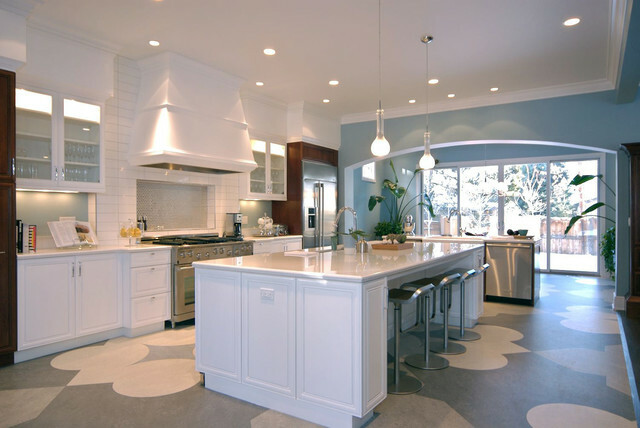 Love the pendant lights! - Can you tell me about them. is there anyway to get a response for the lighting question? What is the flooring, how did you get the shapes in the floor? look like a linoleum flooring, not my project. 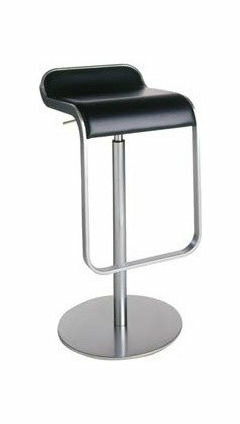 Who is the manufacturer of the barstools? This is the LEM Piston Stool. I think this is one of the cleanest barstool designs. I absolutely agree! Thank you! What should I do to be able to read description on right side? Hi there! I'm not sure what your seeing so I don't know how to answer your question. What would you like to know about this photo? how do you find a marboleum dealer near you? I live in a small town on the coast of Georgia..... - ....and would it be appropriate for rooms other than the kitchen? ie bedrooms?? thoughts?? what color of blue is that? Yes, please! The color and mfg would be great. I have chips all over my kitchen and am afraid that I am going to end up with "little boy blue"! how is the under cabinet light fixed? It's pre wired during construction and then mounted to the underside of the cabinet. What material did you use for the hood? This is a wood hood. What is the specific name/brand of the paint on the blue accent wall? I don't have the exact color, but Ocean Breeze 2058-60 by Benjamin Moore looks very close. love the layout - are there any photos of the rest of the house? Cabinetry - What color is the cabinetry? size of island? - what are the dimensions of the island? Hi, beautiful countertops: what is it, please? thank you so much! Could you tell me the length and width of the island. Thanks so much! What is the backsplash? So sleek! What is the brand and name of the countertop? Could you tell me the dimensions of the island? where can you get these pendants? Floors. With flooring being one of the most expensive surfaces in a home, I'd advise there be absolute certainty that this is the one. But if it is, a patterned floor such as this is both unique and dramatic. Flooring. Opt for flooring that requires just damp mopping and that has no grout lines, such as Marmoleum, linoleum or sheet vinyl. Although hardwood is easy to clean with a dust mop or a damp mop, you must immediately wipe up any spills or splatters, so you’ll find yourself wiping up more often. Linoleum floors. Poor linoleum. Over time it's been confused with ubiquitous and often not-so-nice sheet vinyl, when in fact the two have little in common. True linoleum is made of natural materials, including linseed oil, and is inherently antimicrobial — a pretty neat trait for a kitchen.Linoleum is available in sheets, tiles or planks. If you're not creating a pattern with tiles, I recommend using sheets, as you'll have fewer joints and fewer places for the floor to show its age. Make sure that any adhesives are free of solvents and labeled "no-VOC. "Forbo's Marmoleum, the best known linoleum, carries a 25-year warranty and offers more than 120 colors of sheet goods. This kitchen shows how linoleum can be an artist's canvas for color and pattern. Linoleum also comes in large sheets that can be laid down as a solid color — or you can have a bit of fun with it. A pattern that's bold and bright and unique to your home is something that you'll only be able to achieve with a material like linoleum. Just don't try to do the installation yourself. Getting the cuts and seams just right will be worth the cost of bringing in some pros.